"Aside from losing early on, the tournament was great. Well organized, well run, good weather, nice facilities and nice people. I look forward to returning and not losing early! " "Yvonne and I commend Jim Claycomb and his staff on an excellent tournament. Very well run, lots of food and refreshments for players and spectators, a great venue and excellent competition." Tom Henry from Maryland shared more good comments about the games and was surprised with the great level of play. 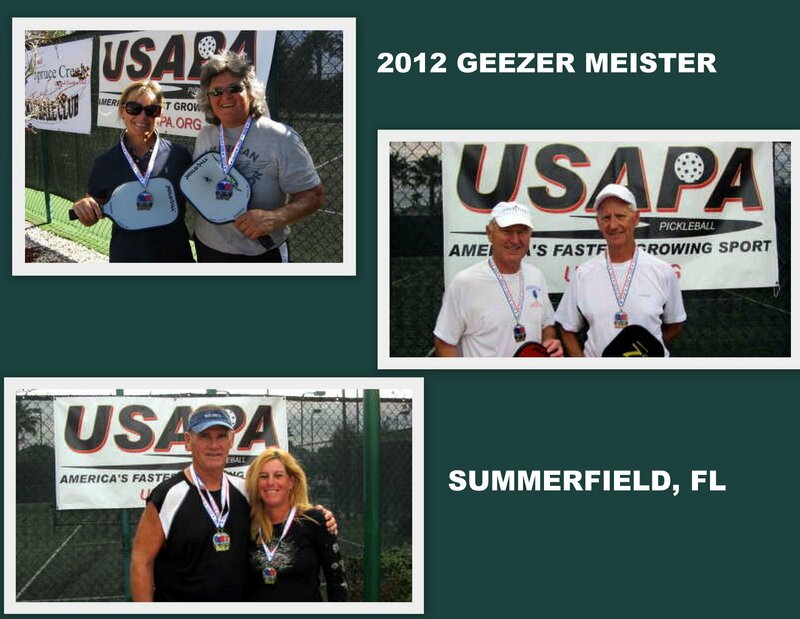 The Hackenbergs from Michigan took the gold in the mixed over Florida's Deb Harrison and Bill Freeman. But in the men's doubles, Jim Hackenberg and North Carolina's Paul Coletta could only muster bronze in the Men's doubles behind Florida's Art Severn and Jim Claycomb (silver) and Barry Gee and Don Piper (gold). The two feature matches of the tournament: The 60-64 mixed with Hackenbergs vs Freeman and Harrison --they split 3 matches in the double elimination and had a huge spectator crowd! The other was the 60-64 match with Don Piper and Barry Gee against Art Severn and Jim Claycomb.. Again, they split 3 matches and had everyone watching and cheering. "The Geezer Meister Pickleball Tournament was held January 19th - 21st at Del Webb Spruce Creek near Summerfield, Florida. This year saw a growth to 282 entries from 190 individuals. The USAPA granted a tier 3 status to the tournament. Players came from Michigan, Illinois, Kentucky, New Hampshire, North Carolina, South Carolina, Texas and throughout Florida. Several national champions were present. Players and spectators were entertained with fabulous pickleball, and plenty of good food. The tournament featured a double elimination format in men's, women's and mixed doubles. 12 courts were kept busy throughout the day on Thursday and Friday. In two age divisions, play continued into the evening, under the lights. In the end, we saw very few repeat champions. That's a great testament to the players, and to the sport."